This article discusses a feature that is only available to Dropbox Business and Dropbox Enterprise teams. Learn more about the new Dropbox Business plans. As a team admin, you can add your company’s logo to links shared outside your team. 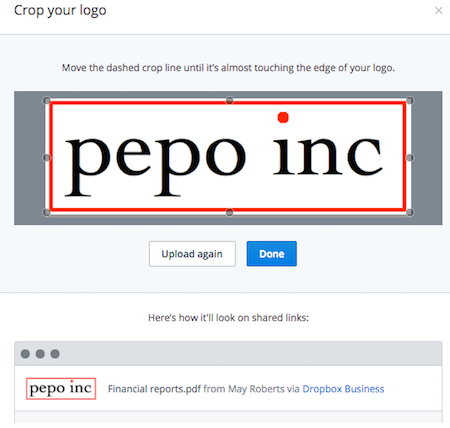 Specifically, your logo will replace the Dropbox logo on any shared link that a member of your team sends to anyone outside of your team. Drag an image file from your desktop or any folder on your computer (including the Dropbox folder), or click to select a file. Note: While technically there's no size limit, images smaller than 4 MB in size will upload significantly faster. Additionally, we recommend formatting images as .jpeg or .png files. Once your image is loaded, you can crop the logo as needed. Preview the logo image, and click Done when you're finished. If you're a team admin, you can remove or change your logo at any time. To do so, follow the instructions for uploading a logo and select Remove logo or Upload new logo when you reach step 4. What will a branded logo on a shared link look like to recipients? To recipients, a branded logo on a shared link will contain your company's logo beside the doc or file title. I uploaded a logo, but I don't see it on my shared link. Why? A logo will only appear for recipients who do not yet have access to the file. If you already have a file in your Dropbox (via shared folder), or you're viewing your own link, you will not see a logo. What if a non-team member creates a link from a team-owned shared folder? If a non-team member creates a link from a team-owned shared folder, this link will also have your logo. The logo is attached to shared links based on the shared folder owner (or owner of the file, if not within a shared folder). Will custom branding affect shared links on my personal account? If you have paired your Dropbox work and personal accounts, custom branding will only add a logo to shared links on your work files. Shared links from your personal Dropbox will not be affected by this feature.